Kosi, the sorrow of Bihar, has remained an enigma for engineers and policymakers for the number of avulsions it has had till date causing huge floods every time. It was as recent as 2008 when it breached the embankment in Kushaha (Nepal) and shifted 108 km eastwards. 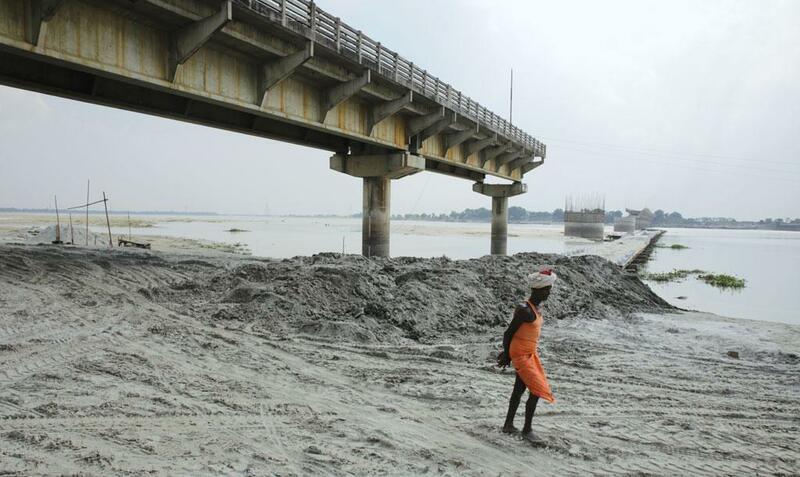 The cause behind the woes for those living along the banks of Kosi could be 1,082 million tonnes of silt that has been deposited in it in the last 54 years. This has come out in a study conducted by professor of earth sciences at IIT Kanpur, Rajiv Sinha. "Our first order estimates suggest that the total mass of sediments accumulated between Chhatra and Birpur (two gauge stations of Kosi in upstream region) during the post-embankment period could be approximately1,082 million tonnes. This translates into 408 million cubic metres in terms of volume and this may have accumulated at a rate of 5.33 cm per year," says Sinha. This is the highest amount of silt deposition in any river of the Ganga Basin, professor Sinha told Down to Earth over phone on Thursday from Patna after the formal release of the report there in the presence of several ministers. The work of constructing embankments on both sides of Kosi was completed in 1955-56 and the period after that is called post-embankment period. Sinha calculated these figures by sediment budgeting—averaging the decadal sediment data of the last 54 years. There are three gauging stations available in Kosi river stream—Chhatra to Birpur (upstream) and Birpur to Baltara (downstream). While Birpur and Baltara lie in Bihar, Chhatra falls in Nepal. The gauging stations have equipment installed to note to study height, discharge, chemical properties of water and other properties. "The silt causes the level of riverbed to rise. As a result, the natural longitudinal (straight) course of the river is disturbed. Therefore, the river searches for a lateral path (left or right). As a result, it changes its course and breaches the embankments on the new path it has created. The breach of embankments causes flo­ods,” explains Sinha. The study titled 'Scoping Study of Siltation in Kosi river of Bihar' also tried to find out the scale of siltation using satellite images. The professor and his team studied the pictures for every year available from 1972 and found that sediment deposition along Chatra-Birpur stream was to the tune of 742 million tonnes (280 million cubic metre in terms of volume) and 1,590 million tonnes along Birpur-Baltara stretch (600 cubic metre in terms of volume). “For policymaking, I would suggest that the data collected by us using satellite images must be used as it gives year-on-year picture,” says Sinha. It was the first such comprehensive study on siltation of Kosi river conducted at the behest of the Bihar government supported by the UK Department of International Development’s Action on Climate Today. His team also identified the hotspots of silt collection by dividing the entire river stretch in 37 reaches. Most of them lie between Supual and Madhubani districts of the Bihar. “We have classified the entire stretch between Chhatra (upstream) and Baltara (downstream) into five zones, according to the amount of silt deposition: (I) very low aggradation,(II) low aggradation, (III) moderate aggradation, (IV) high aggradation and (V) very high aggradation. Zone IV comprises reaches 2, 12-13, 17, 19-21. Zone V, which comprises reaches 9-11, 14-16, and 18, has the worst siltation. Almost all of them are downstream of the barrage falling in Supaul district. Further downstream, the reaches 22-37, falling in Saharsa district, are classified as low to very low aggradation zones and both channel and bar areas have remained stable over the last 54 years,” the report says. The significance of identifying the hotspots lies in the fact that these areas deserve major attention in terms of dredging, Sinha says. Why does the study endorse the idea of dredging? This study is significant as it also tries to settle the debate over dredging as a method of silt management. One of the most common refrains against dredging, a project that usually involves hundreds of crores, is that once the silt is extracted from the river, it is dumped on the river bank itself because engineers don't know what to do with it. Soon it goes back into the river, and thus, the money literally goes down the drain. This report, on the other hand, spells out various commercial uses of the silt. The samples of Kosi silt collected from different regions were sent to the Central Glass and Ceramics Research Institute (CGCRI) based in Kolkata to study their chemical composition. “The Kosi silt consists of fine to very fine sand and is dominated by quartz and significant amounts of muscovite mica. Chemically, this is composed of 72-76% of silica followed by aluminium oxide (10-11%), iron oxide (3-4%), potassium oxide, sodium oxide (3-4%), calcium oxide, magnesium oxide (< 2 %) and minor amount of titanium oxide(<1%),” the study says. The study says that the silt can be used as backfill material in road construction. Besides, various studies have been quoted to suggest that the dredged material can be substituted as a raw material for manufacturing fired bricks for use in construction of buildings. The dredged sediments can also be used as replacement of raw material for manufacturing Portland Cement. The report also speaks voluminously about agricultural uses of dredged materials. “The fine dredged sediments can rejuvenate poor agricultural soils. The fine dredged material is used to supply organic content and nutrients to deficient soils to increase productivity. The fine materials also help to hold water and promote retention of soil moisture needed by the crops,” says the report. Not only this, the silt can also be used for reclaiming the land disturbed and/or contaminated by industrial activities and restoring its natural condition. “The whole idea behind of dedicating a large part of our study to sediment management is that if we suggest governments to undertake dredging, the officials must not jump from their seats due to poor knowledge of silt management and use it judiciously so that it can be a win-win situation for them,” concludes Sinha.